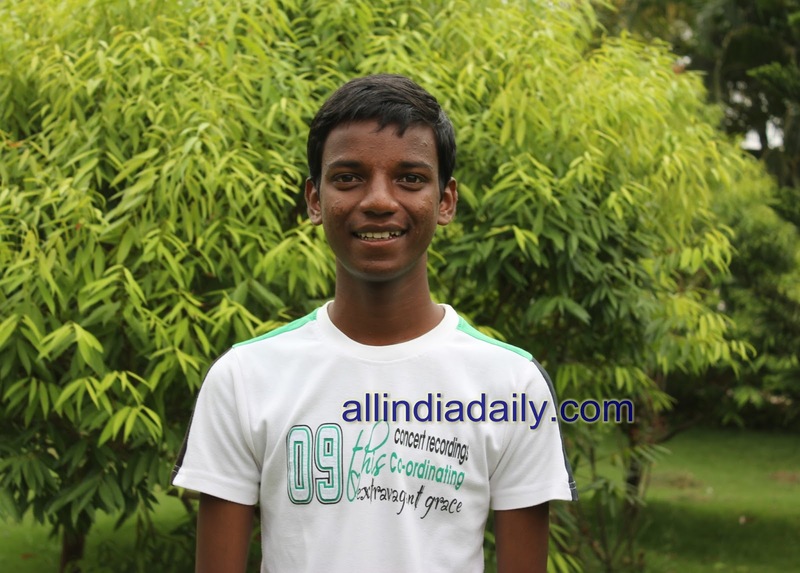 Laxman Hembram is a Santhali boy from the village Murgaghutu in Mayurbhanj District. He is the eldest son in the family of 4. He belongs to poor indigenous household. His father works in a private factory and his mother is housewife. He has a younger brother. Laxman was always motivated by his father to study. From a very early age he knew that he wanted to study. When he was a child his dream was to grow up and become an engineer. Since childhood he has always been fond of playing cricket. He also likes playing carom. Till standard 1 he studied at the village school. It was at this young age he decided that he couldn’t continue his education at the village school because there were only 2 teachers to teach students until class 5. Hence he shifted to the nearby village and studied at a government school to attain education in higher classes. When he was studying in class 6 he came to know about KISS and got himself enrolled at the institute. Laxman is well aware about all the problems that persists in his village with regards to getting basic education. Starting from improper school infrastructure to the quality of teachers teaching, were some of the larger issues related to education and schooling in his village. When Laxman first joined KISS, the transition from remote indigenous village to a fast moving city was not very smooth for him. He felt a little lost when he joined KISS since he did not know anyone at the institute. He did not have any friends and couldn’t adjust himself to the fast paced life in the city. However with due course of time with the help of teachers and his fellow class mates he was able to assimilate himself with the environment and the place. Very soon he made friends and was able to enjoy the education curriculum and extracurricular activities imparted at the institute. Today Laxman feels that he has a lot of opportunities here at the institute because his life has become much routinized. He has the opportunity to experience a lot of things like being a part of extracurricular activities and vocational. He feels very confident because of the teachers and other present at the institute who constantly mentor and guide him. Compared to what he had experienced in his village, he feels that the teachers here are more cooperative and friendly. He can approach them with all his issues and have clarity about his doubts. There is a strict disciplinarian life that he now adheres to. All these factors brings about a confidence in him that he can be someone successful in life. He draws his inspiration from Dr Samanta who has been acutely involved in bringing about positive changes in the lives of thousands of under privileged and indigenous children in the country. Laxman, drawing inspiration from the same belief wants to grow up and go back to his village and work for his village’s and community’s development. During his holidays when he is in his village he takes out time to teach the younger children studying at the village school. He teaches Science and English to the 8th, 9th and 10th standard children. He does this voluntarily because he feels that the children in his village are not getting quality education which is why he interacts with them to know how much they have been able to grasp through their current educational curriculum. After interacting with them he is able to identify how much they have truly understood and how much they have not been able to. Realising that there is a gap in the understanding, he ensures that he helps them get a clarity on the subjects that they need help with. According to Laxman education is important because those who are not educated do not have any knowledge about what their rights are. For him education is very important because it is only by means of education can an individual know about the world around him, can he understand his country and his state and fight for their rights. Only when a person like him is educated, Laxman feels that he can be immersed in the mainstream and have better access to life opportunities. Laxman understands that poverty and illiteracy are two of the most important factors which are destroying the backbone of all those people who are striving to achieve better livelihoods for themselves. Education is one of the important factors through which an individual can break out of the poverty circle and secure a better life for himself. He likes to read story books. In his spare times he likes reading stories to the small children in Anganwadi centres. In his spare time when he is at home in his village, he also likes to go to watch movies with his friends. He likes the Bollywood actor Hrithik Roshan for his dancing and fighting styles. He is a mentor to his younger brother and he also ensures that his younger brother also studies well. Understanding the structure and workings of his village he knows that alcoholism as a problem is increasing amongst the youth. Keeping this in mind Laxman tries to talk to his friends about the evils of alcoholism. He is well aware about all the medical problems that emerges because of alcoholism which is why he tries to bring about some changes in his village structure by talking about the social problem attached to it. He feels that had he not been well educated today, then he would not have any knowledge or information about the social issues prevalent in our society.